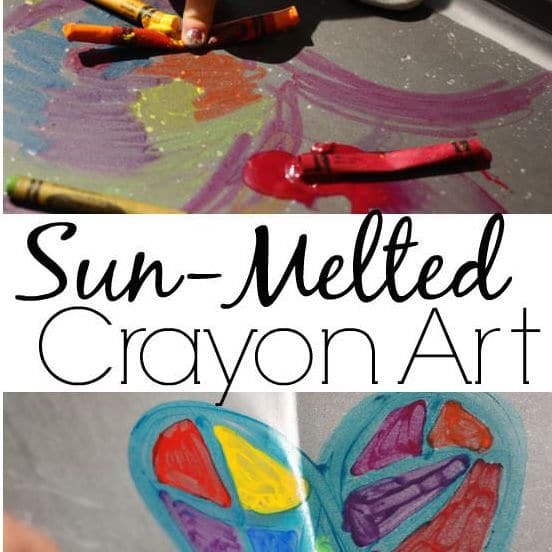 Here’s another super art activity for kids to do when the weather is warm and sunny! 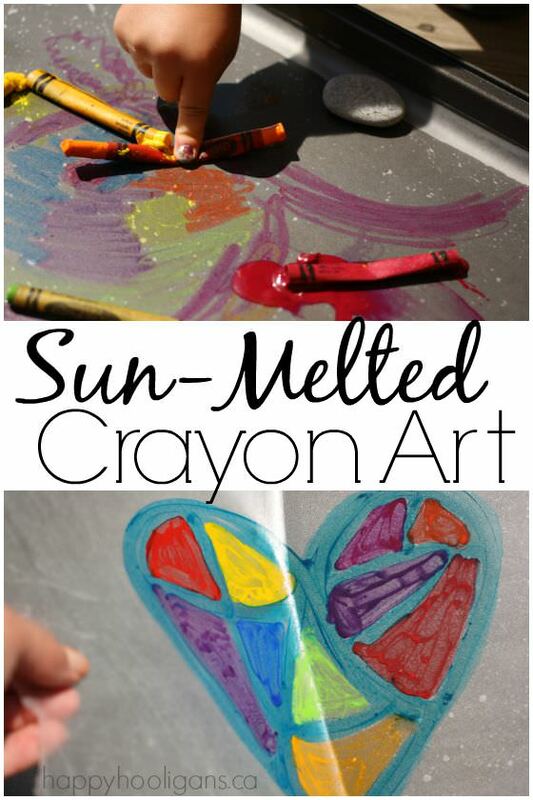 Grab a few crayons and head outside to create some sun-melted crayon art! 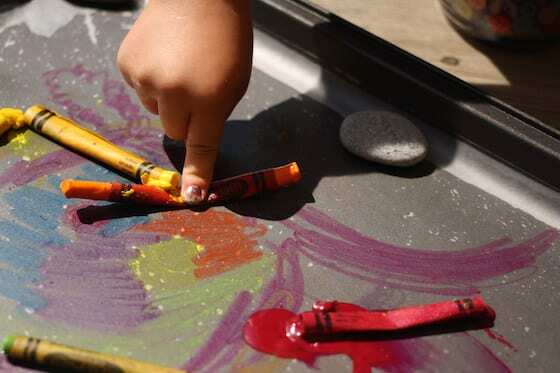 Creating art with melted crayons is always fun. You might be familiar with our Starry Night with Melted Crayons project. It involved grating crayons and melting the in the oven. 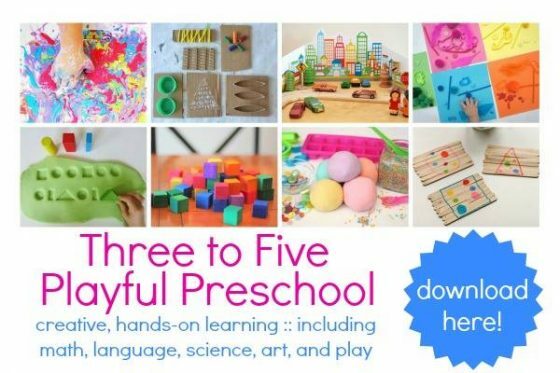 It’s a fantastic art activity but today’s is even easier. All you need are a few basic supplies, and some good, old sunshine. 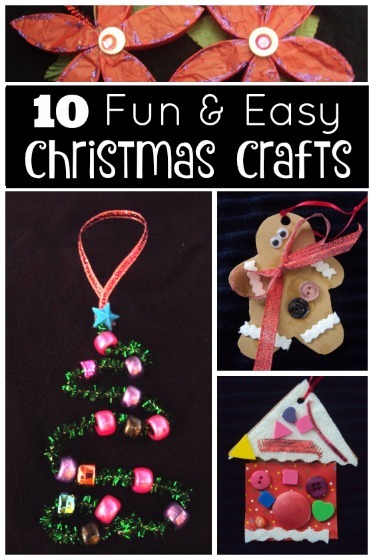 I do believe I may have had as much fun with this activity as the kids did. There’s something so wonderful about drawing with a melting crayon. The wax is so slippery and slick, and it’s really neat to watch the colours puddle and slide together as you’re drawing. We drew pictures, designs and wrote our names for the better part of an hour. 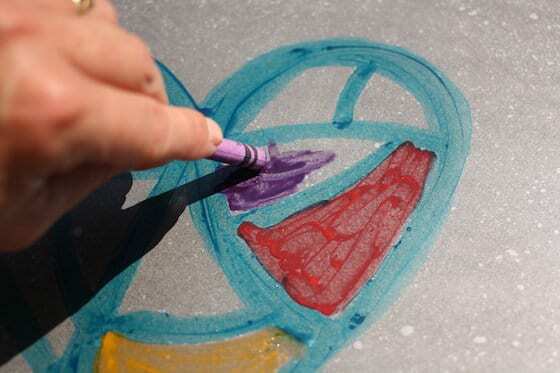 Place a piece of wax paper on a cookie sheet and set it in the sun for a few minutes. The temperature here was quite hot today, so it didn’t take long for our cookie sheet to heat up. When it feels quite warm to the touch, grab a crayon and start drawing. 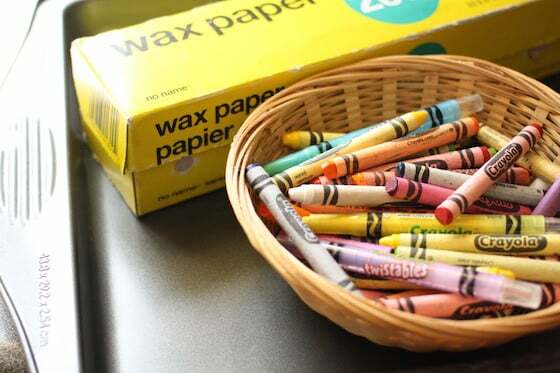 As we coloured with our crayons, the heat of the baking sheet melted the wax, and our crayons glided smoothly across the surface of the wax paper. 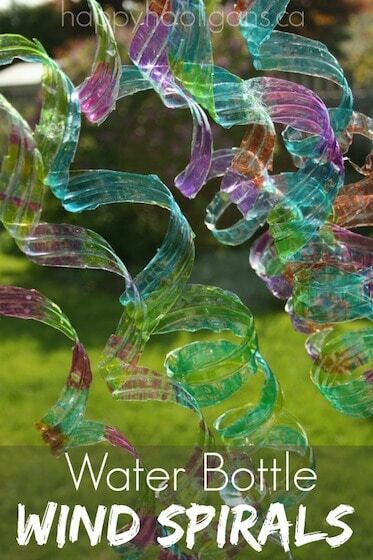 We swirled and scribbled with our colours, sometimes layering two colours together. 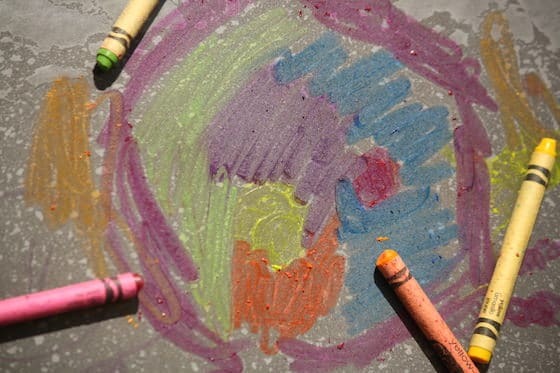 For fun, we left a few crayons scattered on the baking sheet to let the sun completely melt them. Then we squeezed the melting wax out into puddles on our paper. 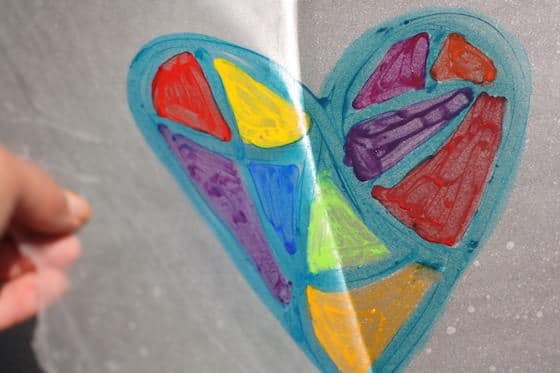 Older kids can make a stained-glass type of drawing, by outlining a shape and sectioning it off with one colour of crayon. Then they can fill in the sections with different colours. 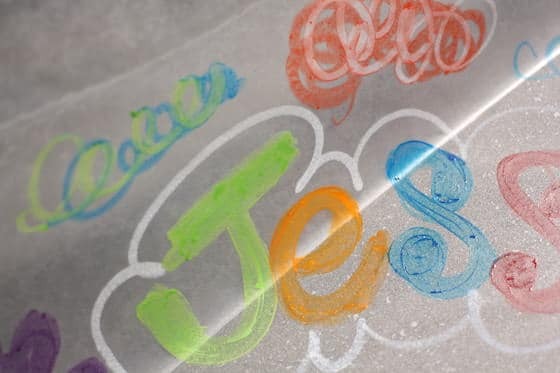 When the drawing is finished, peel the wax paper up off the baking sheet. There might be some residue on the cookie sheet as the coating on the wax paper will melt a bit in the heat of the sun. Don’t worry. 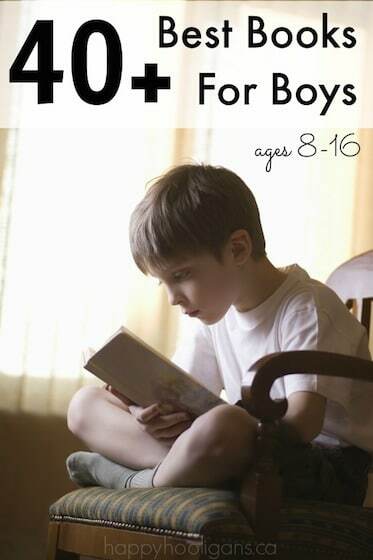 It will rinse off easily with hot water and a bit of dish soap. To display our drawings, we’re going to make construction paper frames, and hang them in the window. 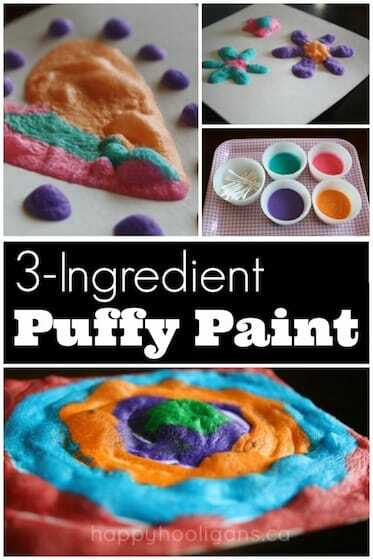 Easy, inexpensive, creative fun for a summer day!